Do you have a cat that you need to train to use a litter box? Perhaps you’ve got a new kitten that has never used litter before, or you’re transitioning an outdoor cat to be strictly indoors and need to teach him where he can appropriately eliminate? Or, maybe your cat has stopped using the litter box for some reason and you need to re-train him or her to use the box to prevent soiling in the house. Cats and kittens, by natural instinct, will dig and use dirt to “do their business” at a very young age – without ever being taught – so you can take advantage of this when training your own kitty to use a litter box inside your home. Until your cat is reliably using the litter box, she shouldn’t have free run of your house while you’re away. That’s not to say you should lock your furry feline friend up all the time, but if you leave the house for any length of time, you should confine her to a single room, such as a kitchen or bathroom that has non-porous floors, just in case she has an accident. Understandably, cats don’t like to eat where they poop and pee (who does? ), so put a bowl of food and water and a warm place to sleep at one end of the room and a clean litter box at the opposite end. Not sure what kind of litter box to choose? 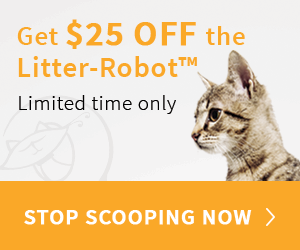 See this collection of our recommended Pick of the Litter…and Litter Boxes. 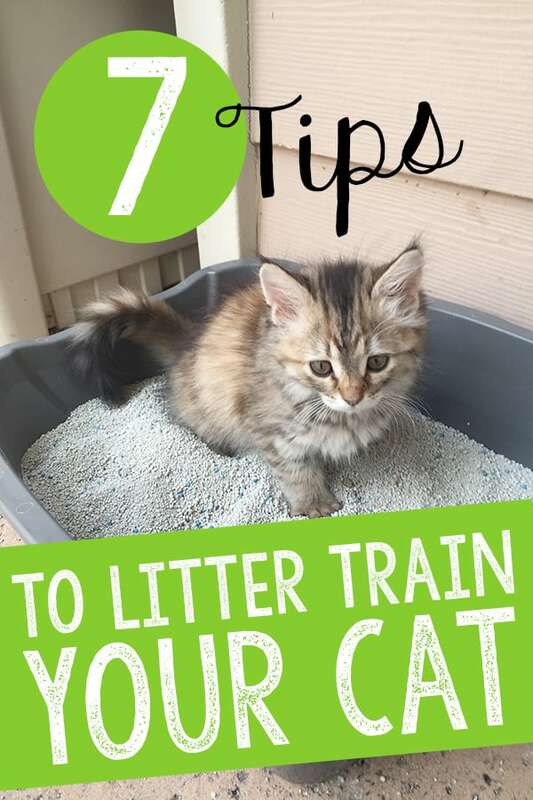 While you’re litter training your cat, it’s important to feed him or her on a schedule. If he eats on a timed schedule, he’ll also eliminate on schedule! Most cats will need to use the litter box shortly after they wake up, again after they eat, and again after they exercise. In order to predict when your cat will “go,” feed him at scheduled times. Then, be sure to reward your cat every time you see him use the box with a treat, a “good kitty” praise, or a scratch on the chin! Throughout the day, call your cat to the litter box from a variety of places throughout your house, especially if you see her sniffing around in places she has previously soiled. Once she approaches the box, scratch at the litter to get her interested in it, and praise her when she shows interest. However, don’t force her into the box. You just want to gently remind her where the box is located. Also, whenever your cat has been asleep for a couple of hours, wake her up and call her over to the litter box. Encourage her to hop into it and praise her when she does. If she uses the box, give her a tasty treat and praise her in a gentle voice when she’s finished. It’s important to understand that punishing a cat for any reason does not work! 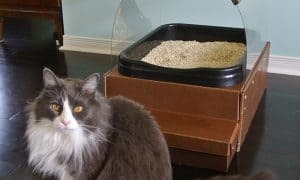 Aversive training techniques do not teach our cats anything, and will definitely not help in teaching your cat to use the litter box. Instead, if your cat has an accident, simply put your cat in the litter box but do not reprimand your cat before doing so! Your cat will only associate the reprimand with being placed in the litter box – which will defeat the purpose! Never rub your cat’s nose in a mess or punish her for having an accident outside of the box. She won’t understand why she’s being punished, but she may begin to eliminate in hidden spots, like behind the furniture. Prevention and praise are the keys to training your cat properly! If your cat does eliminate outside of the litter box, it’s important to clean it up quickly and completely with an enzymatic cleaner like Nature’s Miracle to get rid any trace of odor and hopefully prevent your cat from returning to that spot to go again. 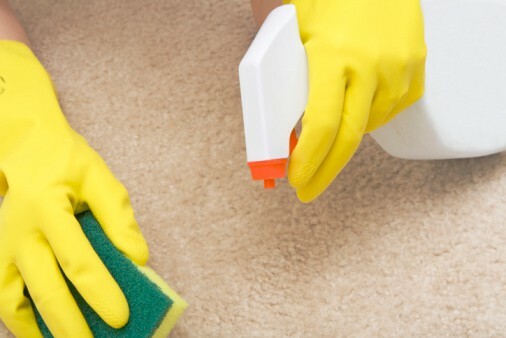 If he does continue returning to that spot, consider making the spot unpleasant, by covering it with a plastic sheet or a large piece of furniture. Or, if possible, place a litter box in that spot. This tip sounds a little bit gross. But, when your cat is still learning to use the litter box, leave a little bit of waste behind when you scoop the litter. For the same reason you need to thoroughly clean any accidents from places you don’t want your cat to go, by leaving a small bit behind in the litter box, you remind your kitty what the box is for. When your cat starts using the box reliably, you should remove all the waste in the box regularly. Cats that learn to use the litter box will keep using the box for life. So, if they stop using it – there’s always a reason. Whether it’s a dirty litter box, stress from other animals, the box is hidden, or a medical cause. If you’ve ruled out other causes and followed all the steps above – or if your cat stops using the litter box for no obvious reason – you should take your cat to the veterinarian. 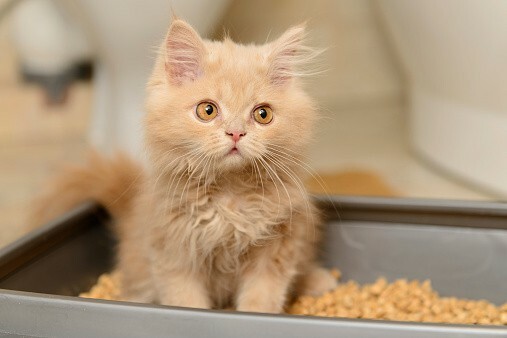 Cats with urinary tract infections may suddenly start urinating outside of the box because they associate the pain of urination with the litter box. Likewise, cats that are sick may have accidents outside of the litter box as one of the first signs that they are unwell. For a more in-depth look at getting your cat to use the litter box, see this article on Solving Litter Box Problems. 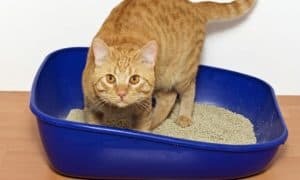 Once you’ve got your cat faithfully using the litter box, you’ll probably want to read this article on how to keep litter from tracking all over the house. And, if you found this article helpful, pin it! QUIZ: How Much Do You Know About Your Cat’s Litter Box?